Sukanya Verma reviews Dil Toh Baccha Hai Ji. Post YOUR reviews here! You know what's funny? That Madhur Bhandarkar actually thought he'd get away with this. You know what's not? The film. To warm up with, what sort of a tag-line is 'Love grows, men don't' anyway? Maybe it's a coded metaphor to indicate Bhandarkar's limitations as a filmmaker or a warning sign that urges us to dispel any hope of intelligence. And intelligent Dil Toh Baccha Hai Ji is not, by any shred of imagination -- yours, mine or borrowed. Speaking of which, snagging Gulzar's lyrical prowess to headline a mediocre script or decorate the backdrop of bland sequences hardly qualifies Bhandarkar and his flimsy sense of humour as novelty or realistic. Then again, aesthetics are not the strong point for a filmmaker who has build his repertoire sensationalising the stark segments of society. The man made some engaging fare before he resigned himself to the monotonous circle of self-designed formulas. This practice of one-dimensional prototypes continues with Dil Toh Bachcha Hai Ji. And so you have the divorcee (Ajay Devgn), the womaniser (Emraan Hashmi) and the virgin (Om Vaidya) living under the same roof in pursuit of affection. The women are just as cursory -- a young 'n' hot secretary (Shazahn Padamsee), a self-seeking Bollywood struggler (Shraddha Das), a bored socialite (Tisca Chopra) and the NRI-goes-NGO heiress (Shruti Haasan). The premise shows promise initially, following a peppy introduction in Paresh Rawal's familiar baritone, a presence you miss all the more as the sham begins to unfold. another effeminate bloke rolling his eyes to blurt out his sexual preference or a divorce lawyer making a creepy pass at Devgn. That's another problem with the movie. It's oversexed. Everyone wears a constantly aroused ex-pression and delivers the simplest lines with the intent of an innuendo. Ribald humour is amusing as long as the joke displays some levity or impudence to make it work. Instead Sanjay Chhel's sloppy lines revel in lame mischief and insipid wit. Even the romance is constructed around foreseeable plot points. Like a lonely boss (Devgn) acquiring a hip makeover to score with his twenty years junior colleague (Padamsee), the kind that gets all wound up assembling trivia like, 'I was three when you lost your V (definitely not vada pav).' Devgn maintains a plausibly stumped ex-pression through most of the ordeal. 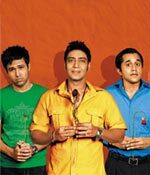 While Omi Vaidya pursues his disinterested girl with an expertly bargained bouquet (the haggling sequence is quite a droll) and corny poetry (another absurd ploy to tickle the ribs), Emraan plays the least gag-friendly character with The Graduate-inspired twist to no avail. The latter's essayed a convincing skirt-chasing lout in so many movies now; it's a stale stereotype. Vaidya, most genuine and spontaneous of the troika, employs his amusing accent and gullible presence to produce DTBHJ's scarce lightheartedness. Considering the plot revolves around these three, the ladies have precious little to do. If Tisca's intensity is completely out of place against the ensuing mockery, Shruti is reduced to post-interval surfacing, last-ditch glamour. On the unbearable side, there's a cantankerous Shraddha Das dilating her pupils through every single scene and Shazahn at her could-I-be-any-more-annoying? best. Armed with an enormous supply of lip-gloss, a painful reminder of how often she squeaks 'Sir, please,' the youngster goes overboard doing earnest. The result is, without question, the film's worst performance. The screen is cluttered with secondary characters that pop in and out without bringing anything to the story other than add to the mess. And that's what Dil Toh Baccha Hai Ji is, a silly jumble of misspent potential and hollow creativity. Ajay Devgn: Why are people betraying the country? Ready for Madhur Bhandarkar's latest experiment?